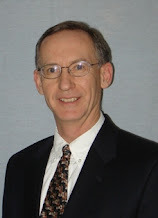 ABB Smart Grid Update with Gary Rackliffe: Smart, smart, smart….so what? We have been talking about smart grid for a while now. We still don’t really know what it means and how to handle it. But we know the benefits or rather we have our own expectations of what these benefits should be. For start, these benefits depend on whom you ask. If you ask consumers (people who pay the electric bills) the expectation is to lower the cost of electricity or be able to better manage their home resources. Well, for some (growing number) of them it is also to start protecting the environment, be more green, more energy efficient but... not at the expense of higher cost of electricity (at least not more than maybe a few percent). 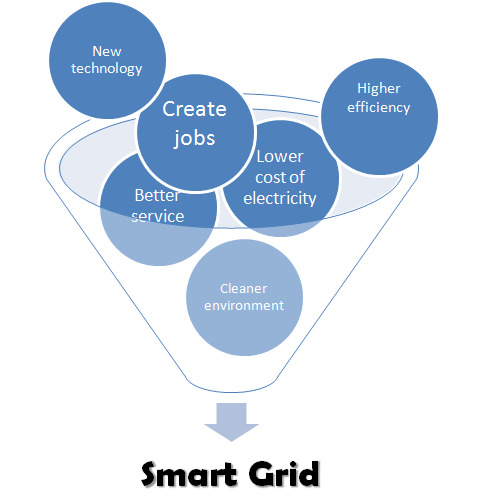 If you ask the electric utilities, they are probably least certain of what the smart grid would bring them. Of course, the underlying principle would be to lower the operating cost of their systems, which would mean higher profit margins. They also hope that they could avoid building new generating plants, or defer some of the major investments in replacing the aging infrastructure. But this is not the end. Ask an equipment vendor, and their expectation from the smart grid “movement” is to promote, implement, and sell new technologies. The technological advancements in the power and especially in the IT industries are truly impressive. Just think of what you can do with your cell phone and how inexpensive (relatively speaking) they became. And all the new software that lets you use internet for your banking, blogging, facebook’ing, grocery shopping and alike. Finally, there is also yet another player in the smart grid arena, the regulators (read: government). They represent the interest of the public, the society at large and their mission is to make the smart grid the greener grid, more sustainable, efficient, creating more jobs, and be more environmentally friendly. It does not take too long to realize that these four groups have often different interests. What is friendlier to the environment might not be necessarily lower cost, to the contrary. The new technology, although it might provide more functionality and better performance, might actually burden the electric utility by overwhelming it with data. So, what we see in the smart grid arena now is a mix of ideas and objectives, often contradictory, or at least seemingly contradictory, that are being funneled into actions. 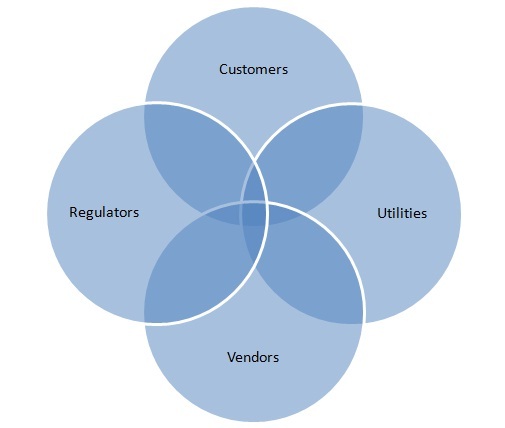 Some utilities are implementing Volt-Var Optimization (VVO), many see a great opportunity in asset health management (see Gary’s blog last week), many utilities have already started automatic meter reading (AMR), advanced meter infrastructure (AMI), meter data management (MDM) and demand response programs that more tightly connect the utility and the consumer. There is a great interest in distribution automation, where many devices on the line can be coordinated, exchange information, and act much quicker when system disturbances occur. Power outages can be isolated and shortened providing a high level of service. System-wide software platforms allow some utilities to compute the power flow and manage, proactively, the balance between loads and sources. Examples are endless. There is no shortage of ideas or concepts. Which ones will catch on, survive and thrive… we’ll have to wait and see. At the end it will be up to us, the society, to accept and embrace what is the best for the environment, for us, and for the future generations. Is smart grid being used as a panacea to all the ills of the electric energy industry? Well, unfortunately the answer is yes. And that may not be a bad thing to do, considering the opportunities that are out there. But, the process of modernizing the grid (read: implementing smart grid) will take a long time. Let’s be realistic, there is no end date for smart grid implementation. There is no magic “flip the switch” and the smart grid will be on. There will be no ceremony celebrating the occasion. If one looks at the utilities in the United States and considers how many years the industry was stagnant and complacent, claiming that it was the most advanced electric power system in the world, it is clear that it would take at least that long to get back on track, catch up with what should have been done a long time ago, and move to the next phase. So, we are talking about a generation or so. This kind of long range process is often impossible to fully predict or control. With this time horizon one can only speculate what will happen and which direction the society will take. But we have to start somewhere. The greatest accomplishment of the smart grid that I can see (forget the new power planning software or a new sensor, or a smart meter) is that we all realized that something has to be done. We might have different views of what it is, but the change is needed, and it will happen. It might not be 100% clear when and where, but the wind of change has started now. And this is an opportunity for all of us, customers and providers, vendors and consultants, students and professors.